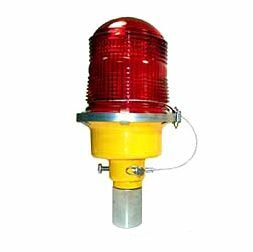 Crouse-Hinds L-810 obstruction lights are used on buildings, antennas, towers, cranes, and any other kind of obstacle which occupies airspace. Each fixture includes a glass Fresnel globe which is colored red for most applications. The fixtures are either a single or a double lamp housing and made with 3/4" or 1" internally threaded housing. A side-mounted option is also available. These obstruction lights operate on a 120V or 230V circuit. Single and double obstruction lights can be outfitted with electronic controls to enhance the operation, automation and reduce the maintenance cycle of the fixture. Common configurations include photocells, flashers, transfer relays and alarms. Note: flashing obstruction lights are not FAA approved. Other options and custom combinations may be available upon request. • Optional grounding wire available. • Flashers used in fixtures are set at 45 FPM, 50% duty cycle. These fixtures are not FAA certified when flashing. • Standard configurations come with 3/4" threaded fittings. 1" threaded and side mount configurations available on request. • FAA style photocells with a 45 second time delay prevents activation and de-activation from momentary light condition.